J.E.B. Stuart, The Christian Cavalier: For non-believers, death is often considered the end of all things, but, to Christians, it represents a new beginning. Our time here on Earth is short compared to eternity in Heaven, and what we do with this time determines our reward in the afterlife. Unfortunately, many people today waste their precious time focusing on self-fulfillment. Sadly, few leave behind a meaningful legacy. A legacy is the memory of who we were and the ways in which we touched the lives of others. History has recorded countless men who served their time on Earth in such an inspirational way. Their legacy continues to live on, years and years after their death. Such is the story of J.E.B. Stuart: soldier, servant, and Southern hero. In the end, it was far more than the service record, personal items, horses, and other accoutrements that Stuart left behind. It was the deep spiritual roots and patriotism that he had instilled in his children and his men. These are the memories that have truly made his story unforgettable. The emphasis is my own and I did so to highlight the broad strokes that typically accompany these kinds of “studies.” Does this characterization of Stuart have any basis in the history? According to Stuart biographer Emory Thomas the answer is no: “During his first year at Emory & Henry a campus religious revival swept James into the Methodist Church. At home at Laurel Hill, James’s mother had been an Episcopalian, his father was probably Presbyterian; but apart from Elizabeth Stuart’s moral strictures, James had not had much religious education or background. And even after his revival experience at Emory & Henry, his letters to family and friends contain few, if any, religious references. (p. 13) Thomas goes on to mention that many of his military orders did contain references to “Divine Providence.” I quote Thomas not to challenge the idea that Stuart was not a religious man, but to suggest that the subject is much more complicated than these so-called Christian authors admit. The biggest problem for many of these studies is the failure to seriously consider the rich secondary literature that addresses the place of religion in nineteenth-century America. During a recent visit to my local bookstore I noticed a couple copies of Stonewall Jackson: The Black Man’s Friend by Richard Williams, which makes constant reference to his religion as evidence of his paternalism towards his slaves. I spent a few minutes going through the bibliography and was not surprised by the almost complete absence of the relevant secondary literature that covers religion in the antebellum South. I find these so-called Christian biographies to be dangerous because they perpetuate the kinds of myths that divide. The authors may not intend to do this, but the upshot is a reinforcement of stereotypes and divisions that have little if anything to do with history. When is the last time you came across a book on the Christian virtues of Ulysses S. Grant and William T. Sherman? I guess we’re satisfied to think of Grant in the voice of Jason Robards. I know some of my readers are going to conclude that this is evidence of some kind of religious bias. Well, it’s not. I am fascinated by the history of nineteenth-century America and especially the South, and religion is an important component to understanding Americans on both sides of the Potomac. It’s too important to leave to individuals with no real interest or training in the writing of history. There are plenty of excellent studies that focus specifically on religion; they may not be as exciting as the colorful stories contained in many of these Christian biographies and they may not be personally inspiring. That said, if you do need inspiration don’t go to the world of historical fantasy, perhaps you should browse the Self-Help section of your local bookstore. Kevin. This may be a bit long-winded, but I wanted to express my thoughts in their entirety. I am surprised and a bit flattered that you have chosen to do an entire segment on my work – and to quote me in addition is quite an honor. I thank you. I understand your argument as an educator – but I will be the first to say that my books do not belong in the “secular” classroom – they belong in a Bible study (which they are often used for). I also feel that the focus of your criticism may not necessarily apply here. It does bother me a bit that you can’t accept the sincerity and simplicity of my work. It is meant to be a positive study for people to see how being Christian impacts your life and the lives of those around you. Nothing more – and nothing less. You insinuate that my studies, and the works of my contemporaries, are attempting to rewrite history in a vain attempt to put these southern gentlemen on pedestals above their peers. I think that if you read my work (and my friend Richard’s) you would see that we are not attempting to compete with the “academic historians” of the world, nor are we trying to rewrite history. We are merely trying to share the inspirational sides of the gentleman’s lives (mostly focused at a Christian audience). Most of our books’ content takes place off of the battlefield and my goal (which is clearly stated in the Forewords of these books) is to show a more intimate and perhaps spiritual side (simplified of course) for people to see how faith can see you through any trial and tribulation. They can draw their own conclusions. Jackson’s life (IMO) was riddled with tragedy and despair – yet he rose to the occasion and became a man worthy of our remembrance today. Stuart’s legacy on his family and those that knew him (to me) is more of an identifier with who he was than his glorious charges on the field. In other words, (IMO) it was by their faith and devotion to God that enabled them to accomplish the things that they did on the field. I don’t pretend to be anyone other than a believer when I do speaking engagements and online chats, etc. Everyone who knows me is aware that I focus specifically on the religious aspects of their lives. I quote primary sources, but they understand that I am not a military historian that’s going to give them an unbiased presentation. I always make a point of stating this focus on my books and CDs so people understand that they are 100% religious in nature. My next book is a Devotional called “The Southern Cross” and no one will mistake that as a secular work. I have acknowledged my own “Confederate” bias on my blog recently and have tried to expand my studies to include some northern subjects, such as Oliver Howard and Father William Corby, However, I openly favor southern subjects as I am a Fredericksburg resident. So please feel free to comment on the work as you see fit, but please don’t put me in the same category as the Robertson’s of the world as it is not my attempt to compete in their genre – nor could I. You stated that, “There are plenty of excellent studies that focus specifically on religion; they may not be as exciting as the colorful stories contained in many of these Christian biographies and they may not be personally inspiring.” So there is your answer = “they may not be personally inspiring.” Thus the angle that “we” have taken. My intentions are NOT just a façade either as I donate more books a year to churches and military fellowships than I will ever sell. I didn’t write either of these books for the money. It is my own personal way of witnessing for Christ and I don’t charge a cent for anything that I ever do in support of them. I say this not to be prideful but to reinforce that my purpose in all of this is not commercial or monetary in any way. I am simply a devout Christian who also happens to be a professional writer and Civil War buff – nothing more and nothing less. And I think that you are looking at these works through “secular eyes” and need to understand that “we” are looking at them through “Christian” ones. Both ways are totally acceptable in my opinion when presented honestly as what they are. I like to think that most people that enjoy “our” work understand that. Thank you for taking the time to look at my work, and also for allowing me to post my thoughts. I hope my readers will read your response since it is very thoughtful. My difficulty as a teacher and historian of Civil War memory is that your genre is considered by many to be legitimate history – whether you describe it as such or not. Richard Williams’s book is shelved in the Civil War section of my local bookstore. I should point out that I’ve come across numerous references on your blog as a historian. I have absolutely no problem with your interests; however, I remain committed to pointing out where history ends and mythology begins. And in the case of your approach I am afraid that there is very little history and a great deal of mythology. In the end I don’t see how you can have it both ways. On the one hand you want your audience to believe that you are not writing history and on the other your books are about a hisorical figure. Your claims are about an individual. I don’t really understand your distinction between “secular” and “Christian” eyes. If you are making claims about the life of a historical figure than they should be judged by the standards of history. In the end it’s irrelevant whether you are talking about Jackson’s or Stuart’s political beliefs or religious convictions. As consumer’s of history we want to know if the historical record supports those claims. Once again, I will continue to try to understand where you are coming from, but I must add that I am very disappointed that you have chosen to use your forum here (on several occasions now) to publicly criticize my work. It is very difficult not to take it personally when it becomes a recurring theme. Michael, — I am sorry you feel that way, but shouldn’t you take responsibility in identifying the blog passage as your own? I didn’t identify you because the post isn’t specifically about you. Therefore I have not criticized you at all beyond making a claim about the genre as a whole. As always this is not an attempt on my part to criticize you personally. This blog and much of my work as a historian is focused on the way the Civil War continues to operate in our culture and I find this example to be quite compelling for the reasons stated in this post and elsewhere. Just one more point: You claim that your writing is not meant to be interpreted as history. If that is the case then what is the difference between your type of study and historical fiction? And if this kind of approach is not to be critiqued as a work of history then to what extent if at all can you claim to be saying anything interesting about the history of religion in the South? Another great post. You have moved to the top of my daily blog regime. 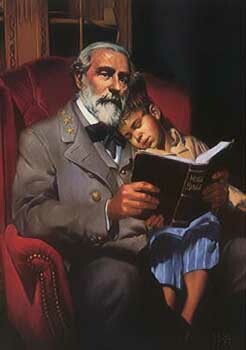 This topic made me think of one of the first Civil War books I read, a biography of Robert E. Lee that my Mom gave to me when I was 7 or so years old. It’s a “Robert E. Lee, Christian Soldier” type of work, now that I remember it. I’m pretty sure she got it at Cokesbury, the big Baptist bookstore that used to be in downtown Richmond. I haven’t read it yet, but I understand that Steve Woodworth’s book on the religious worldview of CW soldiers is great. Charles, — Thanks for the positive feedback. I highly recommend Woodworth’s book. It clearly reflects the importance of religion to the men on both sides. Thanks for mentioning it for other readers. I should put together a short bibliography for those interested. Kevin, I fear that I may have misrepresented that fact. I didn’t mean that I am not to be “interpreted as history.” I meant that my focus was merely one-dimension of history, honestly presented in a biased manner (as a fellow Christian) and not meant to be an academic study covering a wide variety of topics such as a Robertson study. People know the difference (I think?). I only write about these guy’s in regards to their faith and how I believe it had a positive impact. And it was hard not to comment on the quote as you copied it directly off of my blog, and we have many of the same readers. Please don’t misunderstand, I’m not intending to get in an argument by any means – this just seems to be a recurring event, and I am puzzled why I seem to be a regular topic. No need to get in an angry debate here. I just wanted to say my peace and am glad that you took the time to respond. Michael, — You are always welcome to voice your perspective on this blog in response to any of my posts. As I’ve stated before nothing I say is meant as a personal attack. I am simply using this forum to voice some of my concerns that connect to my research interests. My comments are meant to provoke thinking and dialogue whenever possible. My guess is that very few of my readers would have connected that passage with your blog. That at least was not my intention. Again you are always free to respond to the content of my posts. Kevin, I think that we can both respectfully agree to disagree in this matter, but please do not insult my intelligence by saying that your intent was not personal and/or directed at me. This is proven by the fact that you posted: “You can also see these assumptions at work in a number of recent books written by people who have apparently no training in the process of writing history.” and then quote an entire passage directly from my own book and blog. I think that any rational person who reads this thread in it’s entirety will conclude that as well. I will speak no more of this matter, but I would like to offer some kind criticism of my own. You are obviously well-versed and passionate about history. Unfortunately (IMO) you also seem to spend an awful lot of energy on this blog criticizing people that you have never met, and publicly chastising work that you have never read. This is proven by the fact that you have never read any of my books – yet have commented on both of them – and you stated that you read Richard William’s book’s Bibliography – yet none of its content. Sounds like you are guilty of “judging books by the cover” so to speak, and may want to step back, and reflect on that. Personally, I have enjoyed our discussion today and I hold no ill will toward you. I will continue to frequent your blog as I don’t disagree with “everything” that you say – just the parts about me. God Bless. Michael, — You yourself have stated more than once that you have no formal training in historical studies. Now don’t get me wrong I don’t believe that formal training(i.e., a graduate degree) is a necessary or even sufficient condition for writing good history. Actually I have read part of your biography of Jackson and I did read one chapter in the Williams book. God Bless. Starting to sound like a Mud March to me. But what I would like to know is what are the cut out graffiti words in “The Generals Were Brought to Tears”? And what’s the matter Kevin? Never sat next to some child you did not know at Church? Even though we (as historians) continually strive for a more nuanced and mature understanding of history, it seems there are still times when we need to produce PowerPoint slides with easy-to-grasp “lessons learned.” Do you have any thoughts on how to do this? In one example, “staff rides” for the military conducted by military historians illustrate this process. I have been fortunate to watch a very good historian in action, so I have a working understanding of the thought process in this case–something along the lines of projecting modern principles of leadership on historical case studies. So, how would one conduct…how should I put it…a “staff ride” for Civil War politics, race, religion, etc. with clear “lessons learned”? To what extent is it desirable? To what is extent is it possible? The Christian Cavalier approach is certainly one way with some very appealing bullet points for some audiences, but it doesn’t work for me. For each of the past three summers, I have given works-in-progress presentations with research on my home church’s Civil War history (I’ve been lucky finding more material every year). My last one focused on issues raised by Stout, Noll, and Woodworth, and I’ve struggled finding a balance between doing good history and making points that are relevant to the audience and somewhat easy-to-consume (for a 45 minute presentation). I can think of similar examples for popular presentations about Civil War race and politics. Your comments would be read with great appetite and appreciation.